This canvas combines landscape elements—the mass of clouds set against a blue sky at the top and a green stripe with two treelike forms at the lower right—with a thick red horizontal line that ends in a heart shape on the left. 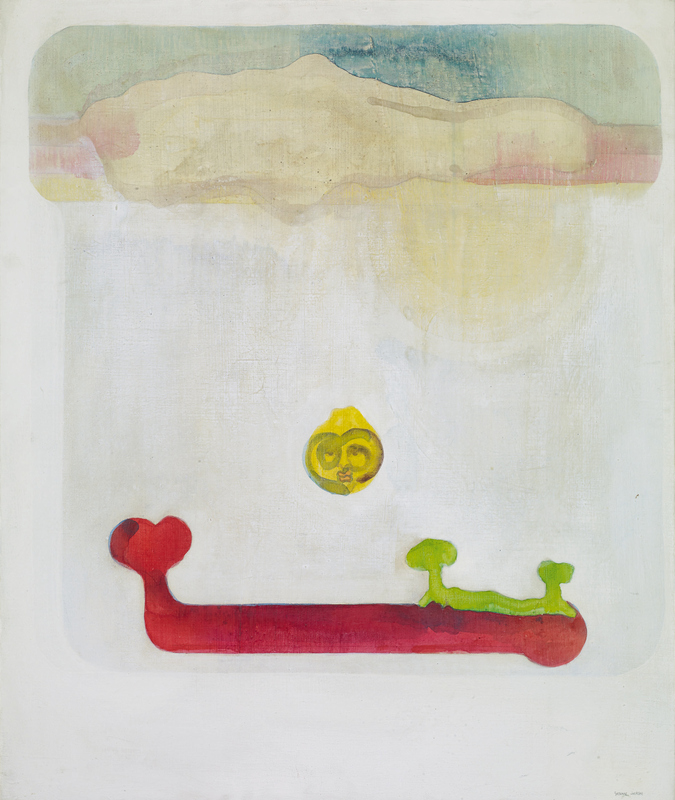 A yellow sphere floats above the landscape like a shining sun, suggesting a sense of renewal. Jackson traces her use of tree forms to 1972, when she drove the country roads from San Francisco to her first solo museum exhibition, curated by Larry Walker at the University of the Pacific in Stockton, California. "Watch Mist." Now Dig This! Art in Black Los Angeles, 1960–1980 Digital Archive. Los Angeles: Hammer Museum, 2016. https://hammer.ucla.edu/now-dig-this/art/watch-mist.